The brilliance of 6.30pm weeknights. This is when learning happens. Eyes and minds are opened. Horizons are expanded and potential is realised. 6.30pm weeknights is when growth, integrity and excellence converge. ... This may be true on the lawns of Oxford, but its certainly not true if you're watching tv here in Aus! And last Monday was no exception. In what can only be described as a night of current affairs greatest hits, Today Tonight and A Current Affair showed that they're the masters of presenting stories that make your brain cells give up and join your liver cells in getting inebriated on whatever alcohol you've consumed. 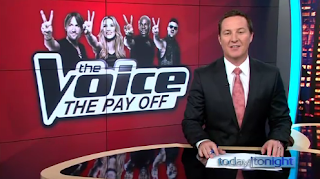 In a night that "Every Australian Must Watch", both programs gave us an extravaganza of the recycled old faithful stories that they do so well. First up was an example of synchronicity worthy of Olympic Gold. And this was a huge story. 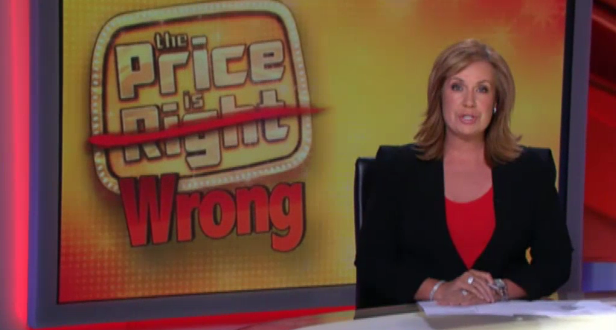 For the 200th time, Coles and Woolworths were pitted against each other to see who is cheaper. In an attempt to be first to cover this earth-shattering story, ACA and TT ended up in a dead heat, and presented the exact same story at the exact same time. If you were flicking between channels 7 and 9 you could have been forgiven for thinking that your remote was broken. The supermarket spokesmen fell over each other to claim the cheapest carrots. So smooth was this covert advertising, that it was impossible to tell where the story ended and the ad break started. In the next segment, both ACA and TT showed us what they do best - the dig at the opposition, expertly disguised as news. In another epic round of the battle royal between 7 and 9, their prize-fighters were out to defend honours. 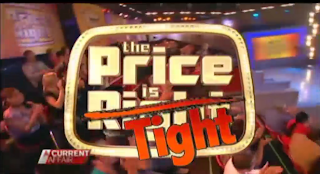 First up we had ACA in an all out attack on 7's The Price Is Right, and how they're conning all of us. "And as you will see, Channel 7 has been caught out playing YOU for a fool!" So how are we being conned? Well, thanks to ACA, we now know that the prizes in TPIR come from a retail website! A tv program is promoting a retailer! How can they get away with this outrage!? Next we'll find out that Masterchef is promoting Coles, or that The Block is promoting Mitre 10. Or even that ACA and TT just did a promo for Coles and Woolworths at the same time. Lucky ACA is here to divulge this top secret information before we are fooled even more in this hideous scheme of retailers trying to sell us things. In a halcyon night for the ACA graphics department, if you thought 'The Price Is Wrong', couldn't be topped, you have been shown! And over TT on 7, the counter attack was on. In TT's sights was 9's golden child with the golden Voice. 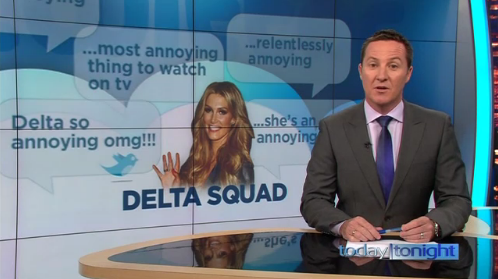 In a devious twist, TT turned to the defence of The Voice host, Delta Goodrem. In joining Delta Squad (? ), TT sold themselves as defender of Australian music's sweetheart, who has been the target of a 'terrible and cowardly' campaign of abuse. While those heartless monsters at 9 sacrificed OUR Delta in search of ratings, thank God the white knights at TT have come to her rescue. But in the assumption that their viewers aren't smart enough to remember anything that happened before the previous weekend, TT failed to mention that only the week before, it was TT themselves who were doing the bullying! "While the contestants battle it out, the judges are cashing in." Not only was there outrage about Delta getting paid to do her job, there were also unfounded claims about forbidden and scandalous relationship with Seal. A single girl getting paid AND getting laid - how dare she! Well I've learnt so much this week. Can't wait for next week's 6.30pm lesson!